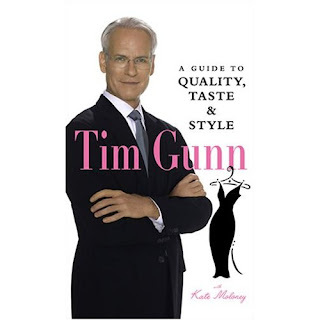 I enjoy Tim Gunn. His ubiquitous "make it work" phrase oozes a certain measure of caring parenting that's almost adorable. And he has a book out. Of course. Doesn't everybody? His book is called "A Guide to Quality, Taste and Style." I am amazed at how many new books are written by famous people these days. The moment one has some success on a popular medium, the next project of choice is book-writing. But I reckon if Pamela Anderson can write what she calls 'novels' and Madonna can pen 'children's books', I shouldn't really be surprised that much any more. Is it too much to ask that writing be left to writers and clothing concoctions be left to catwalk experts? Drop the pen and pick up the needle, Tim. I like you better when you look at strange styles and lovingly tell the stylist to "make it work." yeah. what's that all about? everyone wants to be what they're not. artists want to be athletes, athletes want to act and write. stick to a profession and stay there, i say! it's too confusing. all this moving about. "make it work" in your onw field, ja?